– Fixed that the display direction of the graph changes when the setting is changed by selecting “X-Z rotation” with mouse rotation. – Added a function to read as data format 1 when numeric values are described in 5 or more columns from the top of CSV file. – Added the function to display the numbers sideways if the display interval of the scale numbers is narrow. 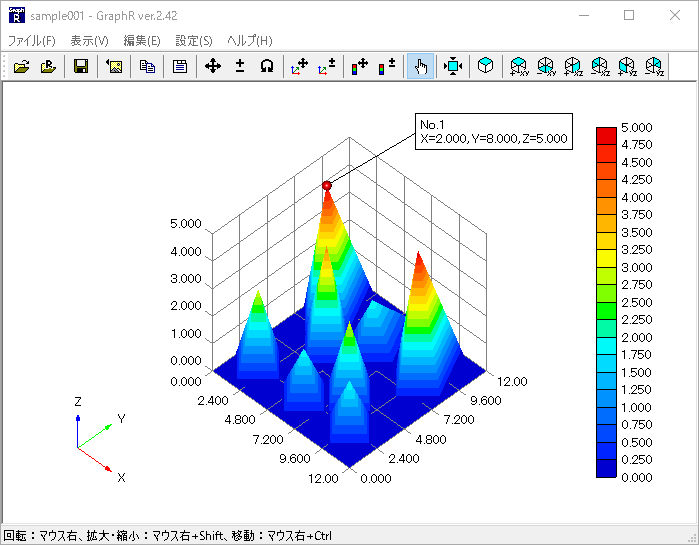 This entry was posted in Graph-R on March 22, 2019 by TOHRU ITOH. This entry was posted in Graph-R on November 9, 2017 by TOHRU ITOH. This entry was posted in Graph-R on November 3, 2017 by TOHRU ITOH. – Fixed that vector is not displayed when the start point is the same in data format 5 or data format 6. This entry was posted in Graph-R on August 11, 2017 by TOHRU ITOH.